Does anyone remember the movie Bio-dome? Staring ninety’s film legends Pauly Shore and Stephen Baldwin? My cousin and I must have watched that movie a dozen times when it first came out. For those of you that haven’t seen it, I will save you an hour an hour and a half of your life, and tell you that it’s basically about two stoners whose environmentally conscious girlfriends leave them because they are slacker burn outs. Pauly Shore and Stephen Baldwin happen upon an eco-experiment called Bio-Dome and get locked in for a year. There is a computer in the dome that gives them real time readings of the environment and will sound alarms like, “Homeostasis, fifty percent. Homeostasis, five percent.” During that time they see the error of their ways and become full on tree huggers. Happy endings abound. I don’t know what it was about that movie that we liked so much. I think the stoner humor was a little over our heads at the time (or maybe just over my head, my cousin was a little older and much more worldly). I may have had a crush on Stephen Baldwin… or maybe even Pauly Shore… the nineties were a really weird time for my taste in men (both in real life and out). I do, however, know that two things from that movie have stuck with me all these (twenty years, seriously, twenty) years later. Number one, it was the first place I ever heard the phrase “think globally, act locally”. We said that a lot that year. Number two, it’s where I learned about homeostasis (sorry high school biology teacher, Pauly Shore beat you to it). The most watered down, best I can explain it while also trying to stop my toddler from throwing balls down the stairs, definition is that it is the perfect set of conditions in an environment that allows it to operate at its peak. Here is the copy and pasted version though, in case my definition didn’t do it for you: Homeostasis is the property of a system in which variables are regulated so that internal conditions remain stable and relatively constant. What does all of this have to do with anything? I’m glad you asked. You may remember from my first ever post, here, that I complained about the Crazier Cat Lady that moved in down the street from us. Well, she and her crazy altered the homeostasis of our street. We need Pauly Shore and Stephen Baldwin, STAT. Just kidding, please don’t let that have summoned Pauly Shore and Stephen Baldwin to my home. I used to be our street’s Crazy Cat Lady. Not only did I have six cats in the house, but I also put food and water out for all the strays. We set up Kitty City for them (a little kitty condo that was on our car port for when the weather was inclement). You could almost always find a stray cat hanging out in our yard, lounging peacefully. I named each one of them (William Foster, William Foster Junior, AC/DC, Van Gogh, the list goes on and on). I was very attached to these guys (back before my entire personality changed and I decided that I hate cats), and I kind of felt like I was the best thing that could have happened to them. Then the CCL came into our lives. I wish I could do her description justice, but I feel like no matter what I write you won’t get the full picture. She was older (I would guess late mid to late fifties). She wore her long black hair in a braid down the middle of her back (EVERY. SINGLE. DAY). I can’t even think of a way to describe her attire other than if her style had a smell it would be a mix of patchouli and cat pee (not that I have anything against people that wear patchouli, some of my favorite people have and are patchouli wearers). There were a lot of patch work vests being worn as well. One evening, early fall, she marched into our lives. With a look of determination and self-righteousness, she walked up to our side door and knocked. It was dinner time and I already have a huge problem with people who knock on the door around dinner time. I answered the door with my attitude already firmly in place. Once she began talking and I figured out that she wasn’t trying to sell something I eased up on the attitude. She was asking questions about all the stray cats. We went through them one by one. One of the strays used to be mine. His name was Hagrid. He had been an inside cat until the summer. Our youngest cat was kind of… handicapped… and Hagrid had put a giant target on his back. He spent so much time attacking him and torturing him. One day I heard an ungodly screaming coming from the bedroom and I came in and Hagrid had Moody (the handicat) pinned down on the floor and against the wall with Moody’s throat clenched firmly between his teeth. The scream was obviously coming from Moody. There was hair and blood everywhere. I was able to safely separate them and in a fit of rage I picked Hagrid up and dumped him out the door. I know, I know, I’m the worst cat mom in the world. I get it. Nobody thinks less of me than I did in that moment. Well, about two minutes after that moment. Because in that moment I was full of rage and glad that he was no longer able to torture Moody. It took just two minutes for me to realize that I threw one of my cats out the door. It was too late, the damage was done. I tried to catch Hagrid but he kept running from me. I was afraid that he would run into the street and get hit by a car so I went back inside and watched his fluffy but sashay down the street. Godspeed you orange mad man, I thought, as he disappeared from sight. I assumed he would be back by nightfall, or you know, when he got hungry. Two whole weeks passed before I saw him again. There was a lot of back and forth with him showing up and running from us. Me catching him and getting him back into the house. Him escaping back out into the wild. Rinse and repeat. My dinner sat on the table getting cold as I explained all of this to CCL. She offered to catch him and get him back to us. I explained again and let her know that I had gotten him back into the house but he had gotten out again. She offered to work some sort of CCL magic and get him re-acclimated to being an indoor cat. I explained that I had a new baby and lacked both the resources and energy to go through all of that again. I bid her a fond farewell, and thought that was the end of it. Nay nay. Slowly, the neighborhood cats began to disappear. One by one, they stopped coming around until there were no more left. 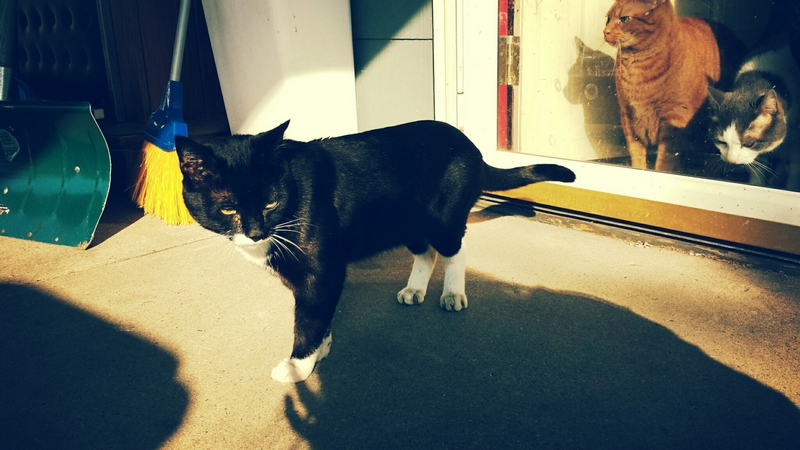 Even Hagrid, who would hang out on the back porch every morning and wait to be fed, was gone. Normally I would have suspected something nefarious, but I knew without really knowing that she was behind it. I wasn’t the only person on the street she had questioned about the strays. I had one fleeting moment where I wondered if that was what I used to be like, all righteous and indignant about the treatment of animals. Now I was mainly bent out of shape about people knocking on our door at dinner time. So, how on Earth did we get from reminiscing about Bio-Dome, to the caramel coated nut bar that was stealing cats away in the night? Homeostasis, duh. Things changed without the army of stray cats in our yard. First, the birds came back. Yay, we all love birds. We have hummingbird feeders (up high where the cats couldn’t get to the birds, we’re not monsters) and regular boring bird feeders. They all got some action, but now they were getting a lot more. Like I said, super, we love birds here. Next came the squirrels. Meh, I’m indifferent to squirrels. I think they are cute. The husband hates them. Our daughter barks at them because anything with four legs must be a dog. Now, now we have mice. Loads and loads of mice. A plague of mice. Mice coming out the ears. Whatever the euphemism for an assload of mice is, that’s what we have. They aren’t in our house (we still have three cats, and if they would like to remain here, they will make sure I never see a mouse in this house). They are in our yard and shed. They ate all our grass seed and our bird seed. Granted, a homeless cat population isn’t ideal in a residential neighborhood, but we had made it work. Now there was anarchy in the streets (well, in the back yard… the shed… for sure). Also, I feel like there is a little something missing from my life now. I’m used to having cats at my feet when I’m outside doing stuff. Now I move about, my egress free of feline interference. I also missing giving out those clever names. William Foster was the most unhappy looking cat I had ever seen in my life (named for Michael Douglas’s character in Falling Down). William Foster Junior was basically his twin so we assume it was his son. Van Gough only had one ear. AC/DC, well that cat had the biggest balls of them all… there were more cats with equally clever names. I’m sure some day the cat population will increase again. The CCR is already gone. We figured out that she was camping out in our neighbor’s yard in an RV. I don’t know when she left, but the RV has been empty for a little while. Over the past month I have seen a little brown tabby cat skulking about, but I haven’t quite settled on a name for him yet. This is AC/DC with Hagrid and Binker (RIP) watching him from inside.